Like the Russian River, wine industry leader Doug McIlroy is part of the agricultural and environmental landscape. With continuing ebbs and flows, McIlroy steadfastly moves forward to navigate a delicate balance between farming and fish, production and preservation. And like the river that has defined his life, McIlroy is tied into Sonoma County’s political landscape as well. Water, after all, is something Californians have been fighting over for 150 years. McIlroy, director of winegrowing at Rodney Strong Vineyards in Healdsburg, has emerged as a respected and valued voice for growers on regional water issues. Amid these water skirmishes, McIlroy works with agencies and lawmakers to seek common ground that keeps farmers from being regulated out of business. He does it all in his professorial, science-based approach to problem solving, believing facts – not emotion – should be first and foremost in any discussion and the final decision. “My mantra: be objective, not subjective,” said McIlroy, 59, who is equal part farmer, environmentalist and scientist. 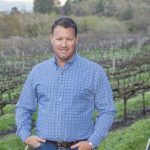 He is active in Farm Bureau and on the board of directors of Sonoma County Winegrowers, United Winegrowers for Sonoma County, American Vineyard Foundation and other groups. 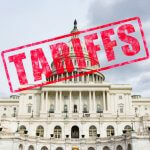 He spends much of his time monitoring issues and negotiating solutions that often take years to resolve. Patience and tenacity are required. Instead of a notebook, he uses his photographic memory to store the facts and images he holds in his head to affect change. “In my advocacy role for regional water issues I pay close attention to policy and regulatory changes, making sure growers and landowners are getting a fair shake or as fair a shake as possible,” said McIlroy, who holds degrees in economics and plant science from U.C. Davis. He said his public involvement on behalf of agriculture is totally supported by his employer Rodney Strong Vineyards. The winery, which has 1,200 acres of vineyards in Sonoma County, believes McIlroy’s work is vitally important to the future of grape growing in the North Coast. In fact, he’s being encouraged to devote even more time on water and the other issues important to agriculture production. Sonoma County Farm Bureau, the county’s largest agricultural organization, also values the work that McIlroy is doing and has given him one of its most prestigious awards. Farm Bureau has named McIlroy the 2018 recipient of the organization’s Luther Burbank Conservation Award, which honors a person or business that has made significant contributions to conservation of land, water and resources. The award recognizes McIlroy’s water and land stewardship and environmental ethic at a time when those values are such an important part of the public pact. “Doug has worked tirelessly on environmental issues, he has been at the forefront of every water issue growers have faced, whether it’s water for frost protection or Ground Water Sustainability. Every farmer in Sonoma County owes Doug their thanks and gratitude for keeping the water flowing to their farms and ranches,” said grape and apple farmer Steve Dutton, president of Sonoma County Farm Bureau. McIlroy will be honored at Farm Bureau’s Love of the Land celebration on July 12 at Richard’s Grove and Saralee’s Vineyard in Windsor. Other honorees are the DeBernardi Dairy family of Petaluma named the Farm Family of the Year and the late Al Gerhardt, a longtime Farm Bureau director and dedicated champion of agriculture and farm youth, who is being posthumously inducted into the Farm Bureau Hall of Fame. McIlroy said he appreciates the recognition that Farm Bureau has bestowed on him and thanks the management at Rodney Strong for giving him the time to work on behalf of agriculture. “I do what I do because it’s the right thing to do. Being acknowledged for doing the right thing is very gratifying,” said McIlroy, who lives in Healdsburg with his wife, PJ Lenz. McIlroy’s sense of place comes naturally. His formative years were the summers spent driving tractors and picking prunes on his family’s Aquarius Ranch along a bend of the Russian River on Westside Road in Healdsburg. During free time, he fished the Russian River, developing a love for the meandering waterway while supporting on-going efforts to bring back salmonids in its waters – efforts supported by agriculture. “I really would like to see the fishing resources come back in the river but in a way that allows agriculture to maintain a foothold,” McIlroy said. He is on the board of Fish Friendly Farming and is president of the Russian River Conservation Council. Born in England, McIlroy’s family came to California when he was three months old, settling in Marin County. His father, the late Malcolm McIlroy, was professor of cardiology at UCSF and a connossieur of fine wine. In 1972, the McIlroy family bought a Tudor-style home and 40 acres of prunes and French Colombard wine grapes on Westside Road. Malcolm McIlroy’s vision was to create a premium vineyard on the property, eventually planting chardonnay grapes that are still held by a family partnership that includes McIlroy and his four siblings. The classic home was sold following the death of his father and mother, Margaret McIlroy, a British nurse in World War II who treated soldiers wounded in the Battle of Britain and Dunkirk. In America, she devoted her skills to rearing her five children. Doug McIlroy worked the family vineyard for many years following high school, gaining skills and a love for the land. He studied at Santa Rosa Junior College and then enrolled at UC Davis where he majored in economics and plant science with an emphasis in viticulture, graduating in 1988. His first job was at Fetzer Vineyards in Mendocino County followed by five years at Kendall Jackson. Both positions were in grower relations. In 2001, he was tapped by Rodney Strong to manage its estate vineyards. Over the years, he worked his way to director of winegrowing, now managing a staff of three and overseeing 1,200 acres of vineyards as well as working with the approximately 60 growers who sell grapes to Rodney Strong. McIlroy helps direct the precision farming, which is handled by Vino Farms. 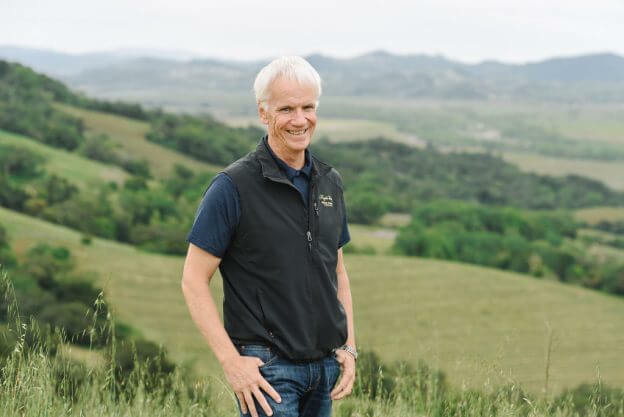 He’s proud to say that vineyards at Rodney Strong are 100 percent sustainable, a goal he promotes to fulfill the Winegrowers’ mission of having all Sonoma County vineyards sustainably farmed. He said farmers have many regulations to abide by but believes most are doing the right thing to protect the environment.